Hologic (NSDQ:HOLX), known in the medtech industry for its mammography and diagnostics devices, is rethinking what it means to be a women’s healthcare company. The 6,000-person company wants to expand its reach to include products that care for women’s well-being, as well as their health – a concept that Dr. Edward Evantash honed when he led the Ob/Gyn division at Tufts Medical Center. When Evantash first landed at Hologic in 2009, the company was focused on a select group of products: its ThinPrep cervical cancer test, fetal fibronectin test and breast & skeletal health division. But early in his tenure, Evantash noted that there was a shift afoot in the company’s strategy. Hologic was actively acquiring and developing products that helped to expand its reach across the spectrum of a woman’s life. The Massachusetts-based company was founded in 1985 and has since grown into one of the largest medical device companies in the U.S. – it brought in roughly $3 billion in revenue last year. But even as it looks to expand into new businesses, it’s not backing away from the ones that it knows best: diagnostic tests and devices. Hologic has an array of tests on the market, including the leading products used to screen for sexually transmitted diseases – marketed under the Aptima brand. It even created a fully-automated system to help laboratories process different assays simultaneously, called the Panther system. The company positions its diagnostic tests as hugely beneficial to a healthcare system overwhelmed by cost. Take for example a test that determines the risk of preterm labor in women who show up to the hospital with contractions, Evantash said. Preventive care is not always top-of-mind for the public, but former CFO Bob McMahon, who moved to Agilent Technologies this month, said the company is working to help change that by educating patients about the value of diagnostic screening. Hologic is a global company – its largest market after the U.S. is China – but the company hopes to expand into new markets where its diagnostic tech could be especially applicable, including India and Latin America. “[Cervical cancer] used to be our number one cancer for women’s reproductive systems, until the Pap test was introduced. And now we don’t think of it as a major cancer any longer. It is one of the most common cancers for women outside the United States, especially in third-world countries. What could we do with our technologies to make them more accessible to some of those communities in those countries?” Evantash added. Hologic is among the many medtech companies that see the future of medical technology in smarter, more connected systems. The excitement about the potential of artificial intelligence is palpable among the medtech industry and the team at Hologic is no exception. “Technology is advancing, especially the world of artificial intelligence. We’re looking at whether or not we can integrate some of our mammography screenings with the algorithms that are used for detection of both breast density and breast cancers,” Evantash said. “For our ThinPrep test, we’re seeing how we can make reading a Pap test more standardized instead of having cytotechnologists looking at it. “Applying that across other technologies that we have, I think, is certainly a potential future for us,” he added. Hologic is aligned with other industry trends, the executives noted. Through its purchase of Interlace Medical in 2011, Hologic acquired a tissue removal device designed for uterine fibroids and polyps. Since then, the company has expanded its MyoSure portfolio to include devices that can be used in a doctor’s office without anesthesia. “We’re really trying to incorporate where we think medicine has gone, where physicians are practicing – moving out of the operating room and into the office,” McMahon said. Last year, Hologic made a billion-dollar-bid for medical aesthetics company Cynosure, marking its move into the periphery of women’s healthcare. Cynosure brought with it nearly $434 million in annual sales, as well as a portfolio of devices like the first FDA-approved laser treatment for non-invasive body contouring, SculpSure. The $1.65 billion acquisition also included Cynosure’s MonaLisa Touch device, a laser designed to restore vaginal health by generating collagen and elastin. That device, according to Evantash, could help address vaginal and hormonal changes that occur as a result of menopause or a hysterectomy. “There’s a lot of anecdotal experience about how it works or doesn’t work. We are committed to actually looking at the data on how these devices and how specifically MonaLisa Touch works to treat something that is incredibly disturbing to women and disruptive to their lifestyle,” he said. McMahon added that the company decided to pursue medical aesthetics because the team viewed it as an emerging area that was complementary to the rest of Hologic’s businesses. Based on the FDA’s recent warning letters to seven device manufacturers (including Hologic’s Cynosure), the industry has its work cut out for them when it comes to proving the safety and efficacy of devices designed for “vaginal rejuvenation” procedures. “We’ve recently become aware of a growing number of manufacturers marketing ‘vaginal rejuvenation’ devices to women and claiming these procedures will treat conditions and symptoms related to menopause, urinary incontinence or sexual function. The procedures use lasers and other energy-based devices to destroy or reshape vaginal tissue. These products have serious risks and don’t have adequate evidence to support their use for these purposes. We are deeply concerned women are being harmed,” FDA chief Dr. Scott Gottlieb said in prepared remarks. “Hologic, Inc. and our medical aesthetics division, Cynosure, are aware that the FDA has issued a letter expressing concerns regarding ‘vaginal rejuvenation’ procedures. As a leader in women’s health, Hologic has a strong track record of rooting our products in science and clinical evidence so, we take the contents of this letter seriously. We are evaluating the letter in full and will collaborate with the agency to ensure all product communications adhere to regulatory requirements,” Jane Mazur, VP of divisional communications at Hologic, told us. Reflecting on his four years at Hologic, McMahon said that he doesn’t think Hologic’s mission has changed, but it has evolved. “I had a philosophy in clinical practice and in academics to be innovative, cutting edge and completely committed to my patients and their families. And that’s why I came to Hologic – because they had the same philosophy and we still do,” Evantash said. See the next generation of leaders at DeviceTalks Boston! 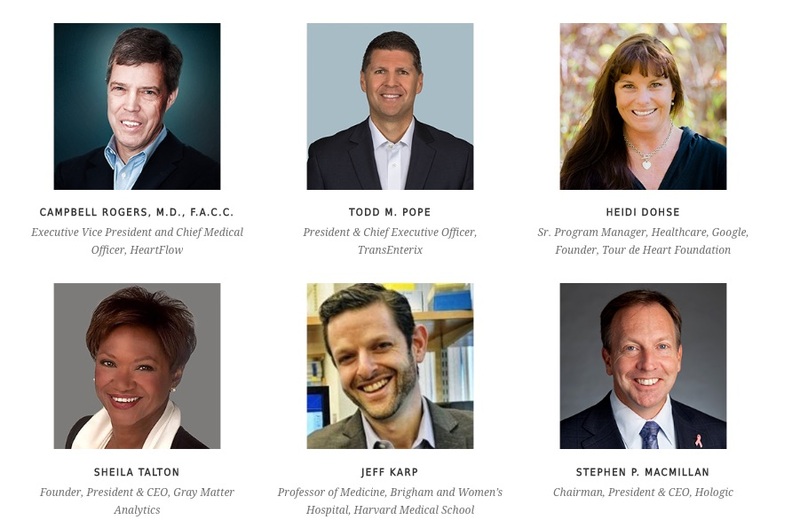 On October 8-10 DeviceTalks Boston is taking over the Bay State’s medtech industry with one of the most anticipated conferences of the fall, bringing you the best and brightest minds in the industry. Register today to save. Use code KEYNOTE to save an additional 10%.